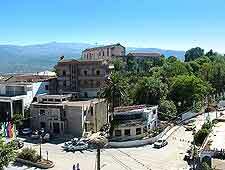 Most of the restaurants and upscale dining establishments of Algeria can be found in its larger cities, particularly Algiers. Elsewhere, visitors have plenty of opportunities to sample local dishes in the small restaurants, cafes and eateries found in most small towns. Alternatively, diners punctuate Algeria's highways and are a great way to sample traditional cuisine. 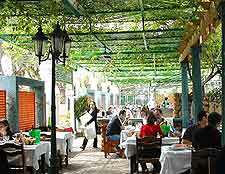 Dining out in Algeria gives visitors an opportunity to experience a taste of daily life and meet the locals. However, if you're simply too tired to search for somewhere to eat after a long day of sightseeing, then some hotels may have their own restaurants to hand. In Algiers and elsewhere in Algeria, evening meals are served from around 20:00 onwards. For snacks and coffee earlier in the day, many cafes tend to open quite early in the morning, from around 06:00. They may also reopen later in the evening. 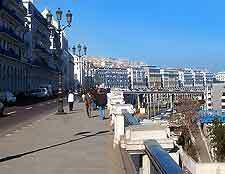 Restaurants and dining venues in larger hotels, such as the Sofitel in Algiers, offer a range of opening hours and menus. Traditional Algerian cuisine has a number of influences, including those from the French, Berber, Arab and Turkish cultures. Expect to enjoy meals based on olives, fruit, vegetables and spices. The dish most closely associated with Algeria is couscous, a staple that resembles pasta but is actually made from semolina. Couscous is served in local restaurants as both as a savoury - with lamb, chicken or fish, and as a sweet dish - with cinnamon and dates. Bread, tomatoes, potatoes, courgettes (zucchinis) and chillies are also often key ingredients in North African cuisine. Even in the desert region of Algeria, fresh fruit and vegetables are widely available. Small cafes generally sell the usual array of snacks, such as brochettes, chicken and salad. And of course, no meal is complete without a glass of mint tea. This hot beverage is popular throughout North Africa and is very refreshing. Following Ramadan fasting, which is widely observed in Algeria, a special meal is served. This usually involves a soup or stew for starters, followed by a lamb or beef dish for main course. For dessert, fresh fruit is always provided. In Algiers and other large Algerian cities, most traditional restaurants serve typical Algerian food. However, in recent years, these have been joined by fast-food restaurants and those with a more international menu to tempt the city's diners. The latter are particularly popular with younger visitors and locals. 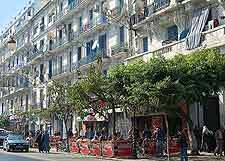 Most dining venues and eateries in Algiers tend to be located in the heart of the city and offer reasonably priced meals. 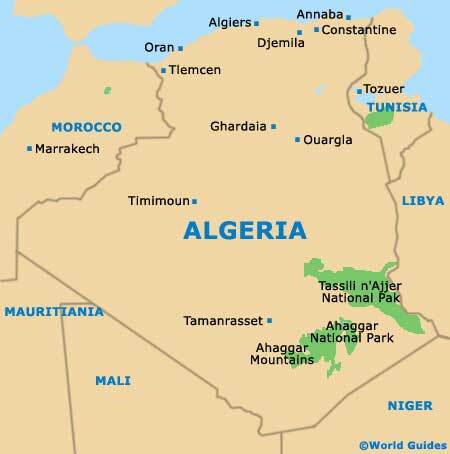 Outside of Algeria's cities, the majority of towns have a restaurant or two, where it is possible to enjoy lunch or dinner, as well as a cafe where you can linger over a cup of tea or coffee. Roadside restaurants are usually fairly basic-looking affairs, from the outside at least, and certainly don't offer a fine dining experience. However, they offer a welcome respite when you're travelling along Algeria's roads and can usually be relied upon to serve a decent meal. Choice of dishes on offer can be rather limited, it has to be said, although it may be possible to negotiate if, for example, you are vegetarian.